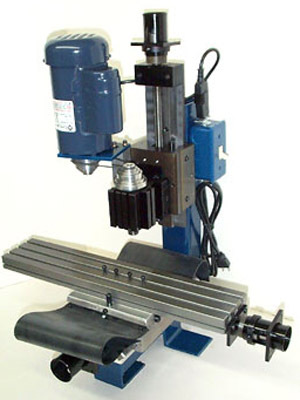 I use both the manual and CNC versions of the Taig milling machine and feel that they are an excellent option for the shop needing a small milling machine of low cost and high quality. 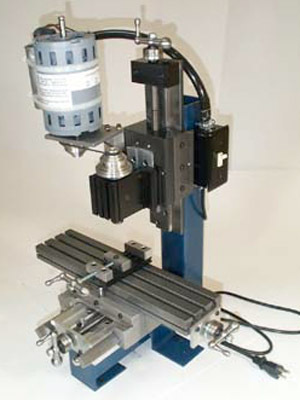 The ER16 spindle allows tooling up to 3/8" to be utilized. Proudly made in the U.S.A.! Taig now offers a ball screw option on the CNC ready and CNC mills! 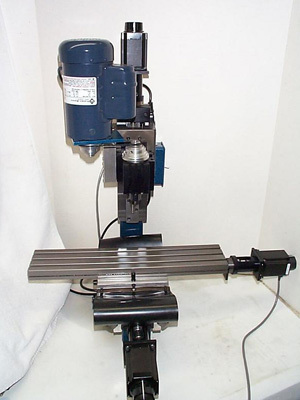 This page also has pricing for the CNC lathe versions, as well as conversion kits, etc. Pulley type std. 5/8 in. bore multi-step vee belt, 6 speeds. Construction - Steel, hard anodized aluminum on all moving components, adjustable brass gibs. X-Axis Hard Anodized Table with tapered Gib and Y-axis with square Steel ways. Hardened ER16 Spindle in Mill Head for superior accuracy. Z-Axis Slide with tapered Gib and Steel Box Ways. Standard Screw is 20 tpi, Ball Screw Version has 2.5mm lead. Travel in X axis 9.5 in or 12 in. depending on which model you order. UPGRADE ANY of the above MANUAL MILLS with a 1/4 hp, continuous duty, 3400 rpm motor. 2019ER converted to CNC ready with Ball Screws on each axis, with Nema 23 motor mounts, and upgraded 1/4 horse power motor . Does not include stepper motors or control system. 2019ER Full cnc mill with Ball Screws on each axis, Nema 23 motor mounts, stepper motors , control system. and MACH3 software. 3 axis Ball Screw Retrofit kit that includes a complete XY Assembly (5019CR/XY) and a Z-axis main body with the ball screw for $1400.00. Customer reuses Headstock, Spindle motor and Z-axis column with the steel plates. Customer will slide the new Z-axis main body onto their existing Z-column. TAIGTurn Mill to Lathe Conversion kit (ER) $699.99 This kit comes with all the parts to convert your TAIG Mill to a Lathe. It includes the following parts 1021W, 300-00ER, 300-24, 300-40, 300-42, 300-44, 2-300-45, 300-49, 300-50, 300-62, 300-64 plus a 1050ER (3-Jaw Chuck), 2 adjustable Tool Posts (2-300-75 ,300-76,300-77) and a set of 6 ER collets 1040ER). ER Lathe Headstock 1-1/4" hex for the chuck to screw up against (22mm x 1.5mm thread). Tool Post Toolholder with slot to hold 3/8" tool. Tool Post Toolholder with two 3/8" diameter holes to hold 3/8" dia. tools. Accessories that can be used on the milling machine. 1/16-3/8" Jacobs drill chuck, commercial quality 3/8-24 thd. 1/8-1/2" Jacobs drill chuck, commercial quality 3/8-24 thd. Fly Cutter, for ER16 Collet, 3/8" shaft, imported. Milling vice with handcrank as supplied with mill. 1" Spindle Wrench, you will need two for the milling machine.